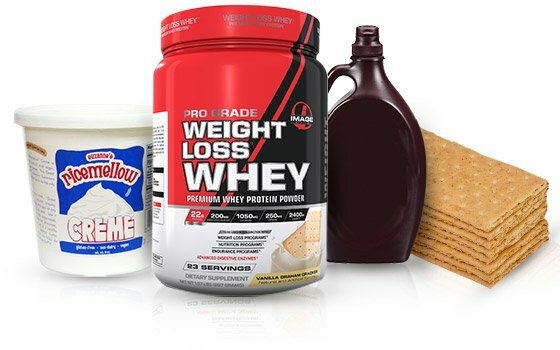 After you see these 5 weight-loss friendly whey protein desserts, you might need extra napkins to wipe the drool off your keyboard. Enjoy! These days, you don't need to look hard to find a copious number of fantastic recipes made with whey and other premium protein sources. From simple-yet-delicious protein pancakes to protein chocolate truffles or even protein Jell-O(! ), there's no shortage of taste buds-pleasing goodies built on muscle-fueling protein and other clean ingredients. Well, the protein buffet just got bigger. Feast your eyes upon tasty cupcakes, a delightful s'mores post-workout shake, and other drool-worthy recipes that aren't only crammed full of protein but help facilitate weight loss, too! The secret is in the added green coffee bean extract, a non-stimulant thermogenic aid that promotes fat oxidation, in the specially formulated whey powder these recipes use. When combined with a proper nutrition and training protocol, these goodies can support your fat-loss goals while keeping your cravings at bay! The battle between cake and pie has raged on for centuries. Here, pie delivers cake a coup de grace with a peanut butter, cookies 'n' cream, and a protein-packed spin on this crust-lovers dessert. Our salivary glands already got rocked into overdrive at the mention of peanut butter, but all of these ingredients combined will no doubt tame the meanest sweet tooth around. In large bowl combine all the ingredients, except the cookie crust and whipped topping. Blend with a hand mixer. Pour into crust and freeze for 2 hours. Once frozen, drizzle with ice cream topping, and re-freeze for 20 minutes. Thaw slightly before serving. This pie is very rich, so thin slices are advised. Unsurprisingly, oatmeal is a firm staple among an active person's diet. After all, oatmeal cooks easily and quickly, and overflows with fiber and nutrients like manganese, magnesium, and zinc to support a healthy immune system and body. Here's a hearty way to pump your morning (or post-workout) bowl of oatmeal full of flavor and protein. 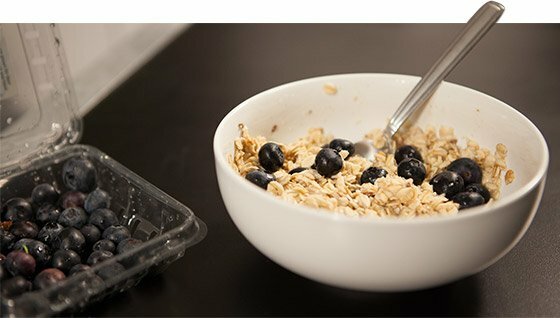 Cook oatmeal according to package directions. Add water until desired texture is achieved. Top with fruit and/or nuts. The very mention of this campfire favorite induces whimsical childhood nostalgia. There's just something magical about the idea of fluffy marshmallows and thick sheets of milk chocolate sandwiched between two crispy honey-golden Graham crackers. This shake will recapture that magic with less mess and fewer sticky marshmallow fingers. Fast-digesting carbs, protein, and a heavenly taste make for a great post-workout shake. In a blender mix together the milk, protein powder, and marshmallow fluff. When that's all mixed together, add the graham crackers and chocolate chips. Add ice until your shake reaches your desired texture! One bite into these babies and you'll get wrapped in a euphoria akin to achieving a successful 1-rep max PR. It's true, the skies actually parted ways for the cupcake deity to alight upon these cakes and bless them with out-of-this-world goodness. The softness of the yellow cake and the tanginess of vitamin C-rich pineapple chunks complement the sweet swirl of cream frosting. Add the power of protein and what do you get? These heavenly blessed beauties! Line a 12-cupcake pan with paper liners. For the cake: Mix together water, cake mix, pineapple, vegetable oil (or apple sauce), egg whites, and extracts. 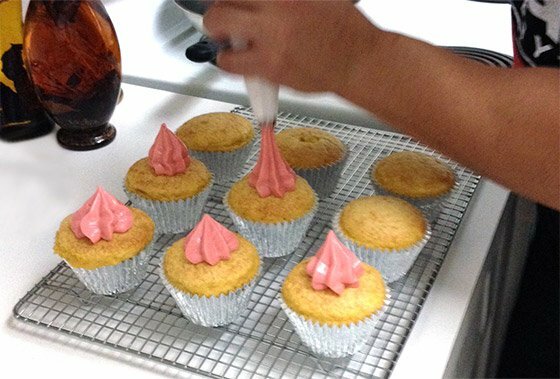 Divide the batter evenly among the cupcake liners, filling each about half way full. Bake 20-25 minutes at 350 degrees, or until you can stick a toothpick in the center, and pull it out clean. Let cupcakes cool completely. While letting the cupcakes cool, make the frosting. For the frosting: Combine the cream cheese, brown sugar, and sugar-free caramel sauce in a large bowl. Beat with an electric mixer until stiff peaks form, and then transfer into a pastry bag (or Ziplock bag) fitted with a wide tip. You can also spread with a knife, but it's not as easy to measure. Pipe 2 tablespoons of frosting onto each cupcake. If the frosting is runny, chill in the refrigerator for 10 to 15 minutes to stiffen. Mix together the granulated sugar and 1 tablespoon of Splenda, then set aside. Thoroughly mix together the yogurt, protein, and vanilla in a medium bowl. Cover and refrigerate for at least 30 minutes to allow the flavors to meld. Put the berries in a small bowl. Add 1 tablespoon of Splenda and lemon juice. Let sit for five minutes, and then divide the mixture among six ramekins. Sprinkle the granola evenly over the berries, and then top with the protein yogurt, filling to the top of the ramekins. Smooth with a mini-spatula or butter knife. Place in the freezer for 5-10 minutes. You still want the top of the mixture to be somewhat sticky. Do not let the yogurt freeze. Remove ramekins from the freezer and sprinkle the sugar-Splenda mix over each ramekin. Using a kitchen blowtorch, caramelize the sugar by slowly sweeping the flame back and forth over the surface of the yogurt. Let the sugar harden and settle for about 2 minutes. 4 Whey Wonders: The Secret Behind Perfect Protein Muffins And Pancakes! Think you can cook recipes with whey protein like it's flour? Guess again. Learn the secrets! Valentine's Day means two things: cuddles and calories. Trade in the latter for guilt-free protein truffles. Grow your love, and your gains, with this recipe!